Koinonein Torrent Editor - The easy way to edit .torrent files. Collections allow you to hint to other torrents that share the same files as the torrent you are creating, for example seriesname.season1 added to you torrent will attempt to get files from other torrents who share this collection. DHT nodes allows you to add a hostname and a port number where there is a DHT node running. This is useful for trackerless torrents as it can be used by BitTorrent clients to bootstrap their DHT node from. 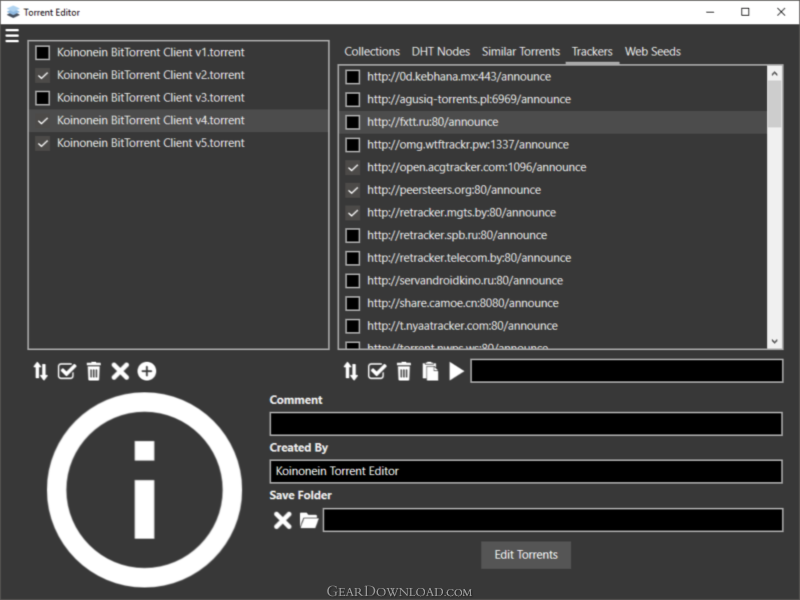 Koinonein BitTorrent Client 32bit 0.1.1.7 - A light, fast and free bittorrent client. NetServe Web Server 1.0.53 - NetServe is a secure Web Server / File Sharing with Perl, ASP and PHP support. Warez Acceleration Patch 5.1.7 - Warez P2P Acceleration Patch is a useful add-on for Warez P2P Client. LimeWire Turbo 6.1.0 - LimeWire Turbo is one of the most popular p2p file sharing application around. Shareaza Turbo Accelerator 4.1.1 - Shareaza Turbo Accelerator is a potent add-on to Shareaza P2P application.